Go over to ACD, they cover this pretty good. Looks like I’m sorted. Seems to be a large selection of clubs to pick from. All sounding pretty cool so far and a pretty easy process. I’m excited and will report on how it all goes. There are a lots of clubs in Barca . I’ve only visited one as I made an enquiry to them a few weeks ago. I understand you need to apply for Membership 14 days in advance. I arrive at an address and it has no signage at all just a buzzer. The door opened and I was greeted by a very friendly young man who asked me a few questions and explained the general rules. Legal to smoke inside the club but that’s it . You need to provide ID which was scanned at the time and after that was done I went thru to the club. Probably 1/2 a dozen types of smoke and similar number of hashes in the club I visited . Quality looked good and you are free to get very small amounts if that’s what you want. Bud tender was again a very friendly person who was very helpful. Place was nicely presented with plenty of pipes bongs and vaps about. All pretty cool and I enjoyed the experience however there was something lacking compare to the vibe of a cs in the dam. It may have been because I was there at a time of few club members so there wasn’t much to do . The thing I like about holland is meeting the people from all over the world and generally people watching . I plan to revisit again over the next couple of days . kiwi_in_Oz wrote: There are a lots of clubs in Barca . I’ve only visited one as I made an enquiry to them a few weeks ago. I understand you need to apply for Membership 14 days in advance. I'd be interested to know what was on the hash menu? Sorry mate it wasn’t anything that grab my attention. Some standard looking black hash and some very expensive 84 euro per gram bho which I couldn’t help but try some. I get extremely little hash at home and got 1/4 a gram . Also said they had some bho imported from Cali. You could buy 10 euros worth if wanted and there were plenty of devices to use. Being a primitive I just put some on the top of my weed in a bong. It was certainly strong but I haven’t smoked for a couple weeks so that would have helped. 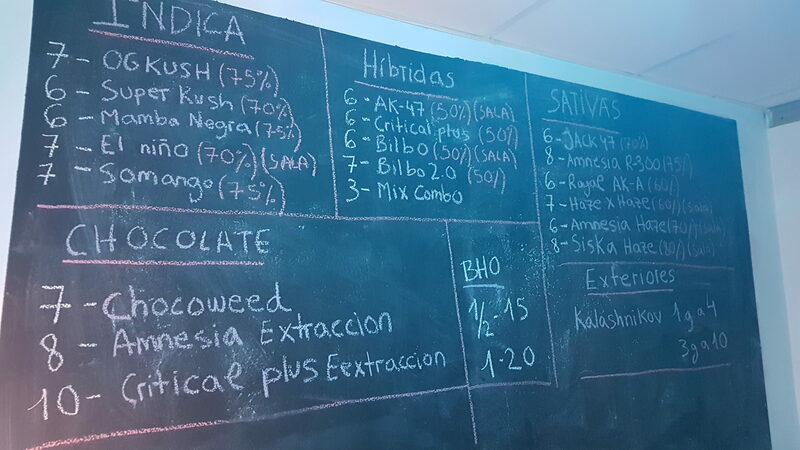 Menu changes frecquently, but weed and hash prices are normally 4 to 10 euro/gram. I am most envious ! Old Fart wrote: Go over to ACD, they cover this pretty good. Maybe this will help the next lucky person heading to Barcelona. Lemming has over 135 clubs listed with maps.